Posted on Jan 8, 11:31 AM in Editorial and Weight Management. Comments . 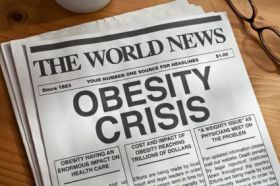 I’ve had to think a long time about what I am going to write about National Obesity Week or, indeed, if I was going to write anything at all. It’s a confusing time to be a Dietitian. This is how my day went whilst trying to write this blog. My first article was about how the traditional “diet” is the wrong way to go – failure rates are high, people do not maintain and do tend to go back to original weights and these “diets” can also lead to unhealthy relationships to food and disordered eating. (* but not for all). Some Dietitians and Nutritionists even suggest that “diets” are harmful. And should we be focusing on weight at all? It’s health rather than weight that we should be talking about. Then I decided to go the way of – discussing where are we failing. Is it the dietary guidelines? (Cue discussions on fat, sugar, industry driven professions etc). Is it mainly societal? (24/7 availability of food, reduced activity, food skills, education and money). Is it our fault as Dietitians? (If so, are we “stuffed” as a society?). So, the next tack I was going to take was the traditional one – looking at the statistics, (which are dire, by the way), the health risks and costs to the NHS. This one fell short for two reasons – firstly there is a lot of discussion amongst Nutrition professionals around the actual health risks associated with obesity and the strength of the evidence and secondly, I would feel a little silly offering any blog post suggestions when the predictions for the UK for 2025 are that 76% of men and 69% of women could become overweight or obese by 2035 if current UK trends continue. I think that any suggestion would seem trite. My final approach was going to be about attitudes to people who carry more weight. (Tempted to write “nuff said” after that but knew it would be no good). Can people be healthy at higher weights? Should we be reconsidering our views on health? Is this a “crisis” at all? Can we try to move away from the horrible, bad attitudes many have to heavier people? God, I hope so. This is a hard one when I can see the attitudes even within my own profession. Once again, don’t think I am on a winner there. It leaves me as lost without a paddle as the rising statistics for obesity. Think I mixed my metaphors there but hope you get my meaning. The theme for this year, and it’s hard to find online by the way, is “Let’s turn obesity around”. The organisers of the week have called for the public to join in with a ‘National New Year’s Resolution’ and pledge to make a small lifestyle change such as exercising more regularly or cooking from scratch more often. This sounds great but given the large percentage of new years’ resolutions that fail, maybe not such a good idea. It also assumes that people who are in the obese category do neither of these things. Given the complexity of the causes of obesity, seems a little like lip service. So where do I stand on this? (This originally said, “where do dietitians stand” but I can’t speak for all when there is disagreement even amongst us on the issues). I know it sounds like a cop out, but I can’t solve the public health issue. In fact, Dietitians can’t. (Maybe if we had some preventative care money and resources but that’s another blog). What I can do is; I can try and help the actual people, who fall into this category, that I see in my work every day by looking at the whole person and without judgment and preconceived ideas about their health and lifestyles. This cannot be a “one size fits all” approach. Some may respond well to restrictive diets or meal plans for weight loss goals, some may work well with reduced carb diets and some may not. Some people may work better with the non-diet approach, where intuitive eating is the focus. Some people may just be better working on improving their health indices, learning to accept the bodies they are in and not thinking about weight at all. Some people might need to overhaul the way they are living and get some sleep, be active, relax and cook and eat regular meals. Everyone is different. I remember when I was in my early 20’s and chatting to someone about weight. I had been on all sorts of diets, having struggled with my weight from the age of 10. She said to me, very flippantly. “why don’t you just have a bowl of bran for breakfast, a salad sandwich for lunch and your normal tea”? It was at that moment that I realised that people have no clue about the complexities leading to weight gain. It sounds so simple. Doesn’t it? So why does the problem exist. I can’t solve this one, at least this year. Heck, I can’t even get involved, confidently, in the disagreements between Dietitians and Nutritionists about the evidence and whether we should be focusing on weight loss as a goal at all. What I can keep doing, however, for those people concerned about their weight and who are happy to trust me and accept my help, is to keep treating people as individuals and to keep trying in my own way to support and help them to become healthier and to feel better about themselves. Maybe next year I can come up with the solution. Thanks Anne, great read. I think that is the key, everyone is an individual and dietitians have the skills to tailor the right ‘diet’ to the right person to make them feel better. Great article….lots to think about. So many factors and constantly changing research. We will always have a job, that’s for sure!